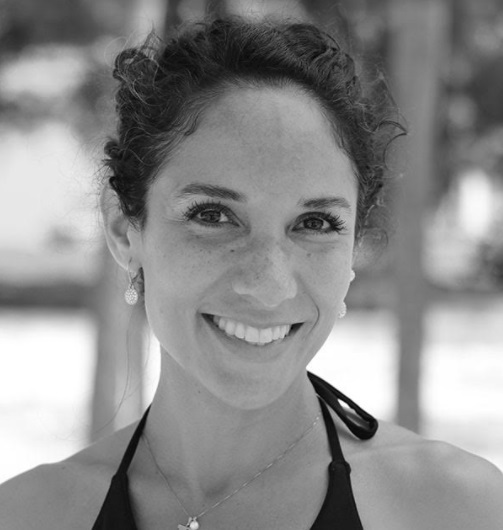 Yely Staley is a Venezuelan born American bilingual RYT- 500H Vinyasa Yoga Instructor who has lived in Chicago and Florida and now resides near San Francisco, California. Yely has been practicing Yoga since 2004 and she received her 200H Certification from Yoga Medicine’s Vinyasa Teacher Training with Tiffany Cruikshank, whose training is a fusion of anatomy and physiology with traditional yoga. In 2017, she received her 500H Certification from Advanced Vinyasa Yoga Teacher Training with Jason Crandell. Yely teaches yoga, meditation and plant based classes and workshops around the world in English and Spanish, and specializes in ‘Mindful Vinyasa Yoga’ which focuses on proper alignment, anatomy, breath, meditation, and compassion. Yely is also a business owner, who currently owns and operates two successful businesses. ‘YogaYely’ is her yoga business and personal brand, and she also owns and operates ‘Prajna Center’ a conscious living center in a charming eco-friendly space located in Belmont, CA, which provides classes and workshops in Yoga, Meditation, and Veganism. I endure. Looking at the definition “to support adverse force or influence of any kind; suffer without yielding; suffer patiently” I am definitely good at undergoing and tolerating discomfort and struggles that may yield in to emotional, mental and even physical pain. Deep down I know I’m strong enough to overcome any obstacles and I endure knowing that I am growing and transforming into a more wise and humble human being. For instance, I endured my parent’s divorce at the age of 17, moving to the US in my early twenties right after college without knowing the language, getting my masters in law while learning English, being temporarily homeless while I transitioned between grad school and my career, giving up my corporate job to move to another state to start a business from scratch during the recession in 2009, and failing the New York Bar Exam 3 times. So yes, I think I’m pretty good at enduring really painful circumstances with as much grace as possible because I focus on what’s ahead. The endless transformation! We all have heard the quotes that in order for a diamond to shine, it has to undergo tremendous pressure and so perseverance along with consistency is what gets me through anything. I don’t give up on my dreams; I do persevere in my actions and remain flexible by adjusting my methods along the way as I work and move forward towards my dreams. My ability to be genuine and authentic in any situation or circumstance, I believe makes me the best version of myself. I have learned that in order to nourish my inner happiness I need to stay true to my inner compass. Many people fold under pressure or give in to societal norms (married, job, house, kids, social status, etc.) but for me choosing to live authentically is what makes me happy; and with that there is a sense of harmony in my actions and my thoughts, which is very empowering. I am an only child, who is child free by choice, switched careers from my corporate job to be an entrepreneur now running my own conscious living center on the Peninsula of San Francisco, embracing a conscious vegan lifestyle, practicing yoga, meditation and kindness, seems to make me the best version of me. My personal aspiration is to be able to teach, help and transform as many humans as possible to find their inner peace and happiness in today’s world. To help them feel balance knowing that they are enough and empower them to embrace a more sustainable lifestyle based on the cultivation of compassion towards themselves and others. My business aspiration is to be successful in making a positive and inspiring impact on this planet, by raising consciousness and awareness of how our daily actions have a tremendous impact in ourselves, our homes, our communities, our surroundings and ultimately our ecosystem. I feel fortunate to have many big success stories in my life. If I were to choose one, it would be learning English in my early twenties and then successfully obtaining my Masters in Law in English the following year. Not only that, but moving to foreign country on my own, was already a very intimidating experience, especially when I didn’t know anyone and didn’t speak the language. Today, as I look back on how far I have come, I can proudly say that I did it on my own, remaining humble enough to accept the help of kind strangers that made this adventure extremely gratifying. The most challenging moment in my life so far was quitting my corporate job in Chicago, Illinois and moving to Sarasota, Florida, around the financial crisis in 2008. My husband lost his job and we decided to move closer to our parents. At the time, I was under the impression that I had a great job and was living in a city that I truly loved. We made the big move around my birthday and after driving for 24 hours straight, we finally arrived and I remember going straight to the bedroom and crying my heart out. I had a true re-birth! Everything I knew about life, until that point, completely changed from that day forward. I couldn’t stop but feel that I just made the biggest mistake of my life. It hunted me for years until one day I realized that life was more than making myself miserable. I needed to stop living in the past and torturing myself with the what ifs, and decided to embrace what was ahead of me with optimism. I finally decided to leave the past in the past and started looking forward to the opportunities and the experiences ahead of me. Sometimes we can predict changes and sometimes we can’t. Either way I’ve learned that changes are a natural part of life, they come as way to keep us in this path of human transformation and self-discovery for growth. It’s been through all these changes in my life that I’ve become who I am today, a strong and ambitions woman with a humble heart wanting to help others to find compassion. The motto that keeps me going no matter what’s going on in my life is “I’m in the path of less resistance and I believe in my own inner potential” I’ve learned to surrender to the unknowns as long as I’m clear where, what and who I want to be. I just take one day at the time and do the best that I can. I practice mindful breathing, meditation and yoga and do my best to help others as much as I can on a daily basis. That’s all there is to it. I enjoy the simplicity of life, I surround myself with the people I love the most, including my precious lovely dog, I spend time with nature, and I enjoy healthy meals; it all helps me to stay grounded and focused. My business role models in the yoga industry are Tiffany Cruikshank and Jason Crandell. Both are extraordinary yoga teachers and mentors. I have actually trained and got my certifications with them because I like their standpoint of how teaching yoga can help us tremendously with our overall wellbeing, especially when paying close attention to our anatomy and learning how to adjust our practice based on our body’s needs. They are both committed professionals, super talented in what they do and the best part about them is that they are both approachable and humble. Their mission is to educate and inspire others to a sustainable yoga practice and career. My personal role models are every human being out there who, no matter what life throws at them, stays positive, smiles and shares love with everyone they encounter. My personal role models are those who always do the right thing, the ones who treat everyone and everything with respect, consideration and kindness, and those who are kind, gentle and compassionate with every single living creature and the planet. My favorite destination is anywhere where I can enjoy peace with nature. Anywhere where people help and support each other. Geographically speaking, I would say Spain and France are my favorite places. These two countries have stunning views of ocean and mountains, excellent vegan food and friendly people. However, as I continue my travels I’m sure I will add to my list many more places around this precious world. My favorite products/objects are those that are made with consciousness and respect to our environment and the animals, offering fair labor conditions. Any product that is sustainable, vegan, cruelty free, organic and fair trade is my favorite. My current passions are to teach yoga and meditation so people can enjoy and feel the health benefits of a healthy body and healthy mind. I also love to spread awareness about a conscious vegan lifestyle, that not only includes what you eat, but also what you wear and use. In my opinion, yoga, meditation and a conscious vegan lifestyle are the three pillars for a happy, healthy and wealthy sustainable life!